This is the Bambicrony Pepe elf from Bambicrony of Korea. The Bambicrony elf dolls are only 10" tall (25cm) and made of high quality French resin. The elves came in limited edition resin colors of Misty Blue, Misty Pink and Misty Grey. Pepe is Misty Blue. The dolls come assembled and with either the face painted or unpainted. My doll arrived without a painted face. They also come with an extra pair of hands and magnetic wings that attach to their back. They come with eyes but no wig. The dolls take 12mm or 14mm eyes and 6/7 wigs. Here she is wearing a Unoa mohair wig and Masterpiece Nebula soft glass eyes. I have finished painting Pepe's face in shades of green. 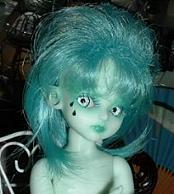 She got rhinestone green "tears", a blue wig and light blue Volks acrylic eyes. Pepe wears a new dress I made for her from a Unoa pattern I reduced. She wears a Tyler red wig and Cleabella doll ballet slippers. Another view of her skull dress and bloomers. Pepe shows off her magnetic wings.